One of my all-time favourite series is the Chronicles of Prydain, by the superb Lloyd Alexander, but I've never read any of his other books. I'm desperate to put that right after reading Jared's brilliant post on his Vesper Holly series, and am delighted to share it with you! When I was a kid, there was but a single author. One. That would seem kind of limiting, but, fortunately, he was pretty prolific. Every time I took a trip to the library, I was guaranteed to find a new book from the living legend that was Lloyd Alexander. I even wrote him once, and he WROTE BACK - a little ‘thanks, kid!’ style note that came with a pamphlet of ‘how to pronounce Welsh names’. Like receiving a scrap of the Holy Grail. As an adult, I’m always nervous about rereading childhood favourites. It is just too risky - what if I’m disappointed? Not because the books will have magically gotten ‘worse’, but that I’ll have grown up too much to appreciate them. And how sad would that be? Still, I give in to temptation... (looks at empty roll of biscuits on desk)... a lot. And time and again, Alexander steadfastly refuses to lose his magic. I’ve now travelled back to Prydain (still breath-taking) and Westmark (possibly even better now, who knew?!) and, most recently, I’ve dared to revisit one of my childhood heroes: the fearless Vesper Holly. Vesper is the undisputed star of a series set in the mid-19th century. She’s a teenage orphan, the daughter of an adventurer father who finally takes one risk too many. Vesper’s rather unceremoniously dumped on the hands of ‘Brinnie’ (her dad’s old sidekick) and Mary, who rather thought they were out of the globe-trotting game. Brinnie’s a proud Philadelphian and was very much enjoying his retirement. Gardens. Etruscan history. Etc. As we learn from the first pages of The Illyrian Adventure, Vesper’s not one to take no for an answer. Despite being in her teens, she knows her own mind. (And what a mind! She speaks languages, knows history and science, can build stuff and doesn’t even get seasick.) Brinnie might think he’s Vesper’s guardian, but as the series progresses, it is very clear that things are the other way around. Everything comes from Brinnie’s point of view, and it is absolutely clear - to Brinnie and the reader - that he is the Watson to her Sherlock. He’s there to chronicle her brilliance, play straight man and occasionally trip over a plot-hook. The six books in the series take Brinnie and Vesper (and eventually a few others) all the way around the world - to places fictional and non-fictional. They go in search of volcanos and missing Brazilian heirs and Cretan beans (seriously) and all sorts of trumped-up excuses. Generally speaking, they all follow a formula. Vesper gets bored, Brinnie gets outvoted, they both wind up on the road. Once in Drackenberg/Jedara/Illyria/etc, they invariably get involved in local politics. Vesper’s good sense triumphs over centuries of engrained silliness (for the good guys) and get them shot at (by the bad guys). Vesper’s personal Moriarty - Doctor Helvetius - will make an appearance, things get tense, things get untense, day saved! They’re as wonderfully pulpy as they sound, filled with improbable scenarios and deliciously goofy circumstances. As a set, we see Vesper grow from a precocious (if preternaturally brilliant) teen to a charismatic young woman. And what’s amazing? That’s never once challenged. The books simply assume - and keep assuming - that there’s absolutely nothing unusual about Vesper Holly being an action hero, an adventurer, a scientist, a historian, a leader and... a woman. It wasn’t until years later, as an adult, that I realised how rare this was - that silly, improbable, wonderfully pulpy adventures could feature young women as well. And without even making a ‘thing’ of it - which is, in many ways, the biggest thing of all. Adventures are for everyone; why wouldn’t they be? I wish every reread of a childhood favourite were this successful. 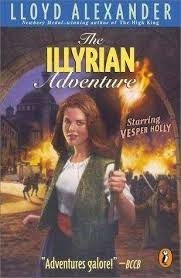 Vesper’s adventures are just as fun as they were when I first read, but now I realise they were important as well. Thanks Jared for a brilliant post! Check him out at website Pornokitsch or on Twitter.